To Inquire about a study on our website.To suggest a clinical trial that you know about but you can't find it on our website.To share Your Story.To give feedback.Other reason. To contact Support.To give feedback.To provide a testimonial.Other reason. 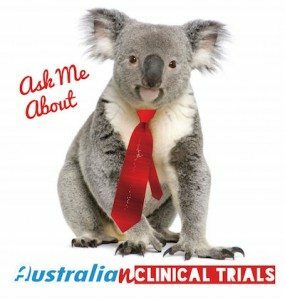 To Inquire about setting up and running a Clinical Trial in Australia.To Inquire about the 45% “cash back” benefit available for eligible foreign companies undertaking R&D in Australia.To give feedback.To provide a testimonial.Other reason.